Graphene is a two-dimensional carbon allotrope that has great potential in various applications, due to its extraordinary electrical, mechanical, and optical properties [1,2]. Specifically, the structure of graphene consists of a monolayer of sp2-hybridized carbon in a hexagonal or honeycomb layout. Before the widespread application of graphene can be realized, two critical challenges need to be addressed. The first is gaining a thorough understanding of the physical and chemical interactions taking place on the graphene surface . The second is the development a large-scale preparation method that is easy and low-cost . The first challenge of understanding the fundamental behavior of graphene, including its surface properties, and physical and chemical interactions, can only be solved through advanced analytical techniques. For the second challenge – developing a facile, low-cost preparation route – chemical reduction of graphene oxide is a viable solution [4,5]. Applications of graphene oxide include transparent conductive films, a tin oxide (ITO) replacement in batteries and touch screens, as well as electrode materials for batteries and solar cells . Most importantly, graphene oxide is easier and less expensive to make than graphene, and so may enter mass production sooner. Of the available techniques, Raman spectroscopy offers scientists an ideal method for quantifying and identifying sample composition. The technique provides information about molecular vibrations, and involves shining a monochromatic light source on a sample and detecting the scattered light. The majority of this light is of the same frequency as the excitation source, but a very small amount of the scattered light is shifted in energy from the laser frequency. Plotting the intensity of the shifted light versus the change in frequency results in a Raman spectrum of the sample . For instance, Bo et al. used Raman spectroscopy to study the structure of graphene oxide and reduced graphene oxide for sensing and energy storage applications . Combined with Fourier transform infrared (FTIR) and ultraviolet–visible (UV-vis) absorption spectra, the authors used these techniques to confirm that graphene oxide was successfully reduced using caffeic acid. It is important to remember that because functionalization of graphene and graphene oxide is so important for applications, a thorough understanding of the parent material, and its functionalized derivatives is critical. Raman is an important analysis technique because the characteristic fingerprint pattern in the spectrum makes it possible to identify substances, and evaluate local crystallinity, orientation and stress . Rajagopalan et al. used Raman spectroscopy to study reduced graphene oxide (GO) as a candidate material for supercapacitor electrodes . Chemical reduction of GO was done using hydrazine, after reacting the former with potassium hydroxide (KOH). The effect of this KOH treatment of GO on supercapacitor performance was studied. Raman spectroscopy, along with other techniques such as Fourier Transform infrared spectroscopy (FTIR), confirmed that functionalizing graphene oxide using KOH prevents complete reduction, leaving residual functional groups on graphene sheets. Another study by Umair et al. used Raman spectroscopy to study deposited bilayer graphene on nickel film . Specifically, they used the technique to examine the uniformity of synthesized graphene, by calculating the ratio of the 2D and G peak intensities over an area of 200 mm x 200 mm. The authors found that the number of graphene layers was uniform over this area, with low defect density. Interest in graphene and graphene oxide, as well as the demand for graphene-based devices is continuing to increase. To keep pace with research needs, development of high-performance Raman instrumentation is essential. 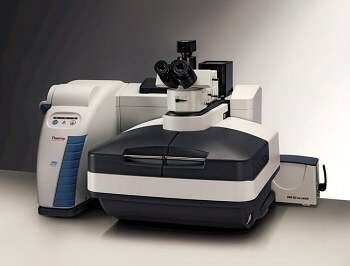 As the end-user, the burden falls on you to choose the best Raman instrument for your research. The Thermo Scientific™ DXR™2 Microscope is a reliable and easy-to-use point-and-shoot instrument providing research-grade results without sacrificing performance. With user-changeable lasers, filters, and gratings, the DXR2 Raman instruments are ready to meet the demands of busy laboratories in academia, industry, and government. And the DXR™2xi Raman Imaging Microscope reveals visual information with speed and simplicity. High performance chemical imaging is now accessible to all, accelerating research for new and experienced users alike.